The simultaneous liquid chromatographic analysis of water- and fat-soluble vitamins is challenging because of their wide polarity range. Typically, water-soluble vitamins are separated and analyzed by hydrophilic interaction chromatography (HILIC) while fat-soluble vitamins are analyzed by reversed-phase liquid chromatography (RPLC). 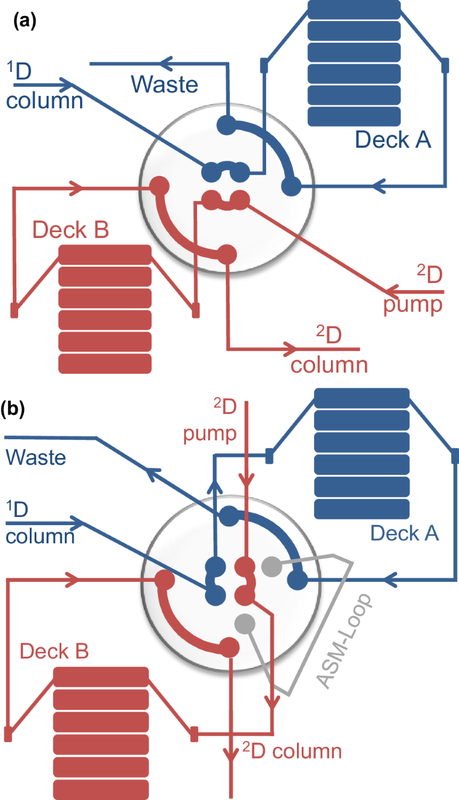 The combination of these two retention principles in a column coupling or multidimensional liquid chromatography approach seems to be a logical consequence to solve the problem. In this work, a selective comprehensive HILIC × RPLC 2D-LC approach is investigated. In this method, the polar water-soluble vitamins are resolved in the first dimension (1D) on a 2-pyridylurea mixed-mode phase operated by a HILIC gradient and the coeluted fat-soluble vitamins in the early part of the chromatogram are comprehensively transferred in ten 40-µL fractions into a second dimension (2D) separation by RPLC on a C8 core–shell column. This mode of separation is also known as high-resolution sampling. 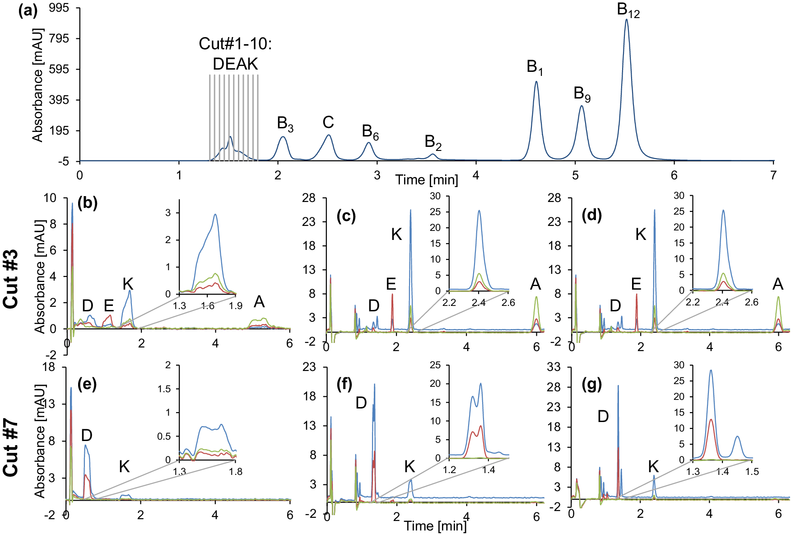 The separations in 1D and 2D were optimized systematically and the retention mechanism on the mixed-mode column interpreted by support of these chromatographic data. The solvent incompatibility of 1D HILIC and 2D RPLC conditions due to sampling of acetonitrile-rich fractions from 1D into 2D RPLC led to severe peak broadening when a direct fraction transfer was carried out. An isocratic refocusing step could partly improve the situation for the stronger retained fat-soluble vitamins. Active solvent modulation with a specifically designed valve which allows a bypass of the weak eluent from the 2D pump to the column head and dilution of the fractionated sample from the sampling loop completely solved the problem and provided perfect peak shapes and chromatographic efficiencies. The online version of this article ( https://doi.org/10.1007/s10337-018-3615-0) contains supplementary material, which is available to authorized users. Multivitamin formulations for nutritional supplementation are recommended under certain situations of malnutrition, some diseases, strong alcohol abuse, and heavy smoking. For pharmaceutical multivitamin products, adequate quality control is mandatory. Yet, the simultaneous analysis of fat- and water-soluble vitamins in one analytical procedure or method is not a trivial task because of the wide physicochemical properties of these vitamins. Quite often, two distinct methods are adopted for the analysis of fat- and water-soluble vitamins [1, 2, 3, 4, 5], while their simultaneous analysis, e.g., by a single chromatographic method is rare. Separation of water- and fat-soluble vitamins into separate samples by solid-phase extraction and subsequent analysis on RP columns with methanol-buffer (aqueous RPLC) for water-soluble vitamins and methanol–acetonitrile (nonaqueous RPLC) for fat-soluble vitamins was one reported approach [1, 2]. Buszewski and Zbanyszek performed the analysis on two distinct C18 columns varying in the ligand density and combined those separations via a column-switching technology [3, 4]. 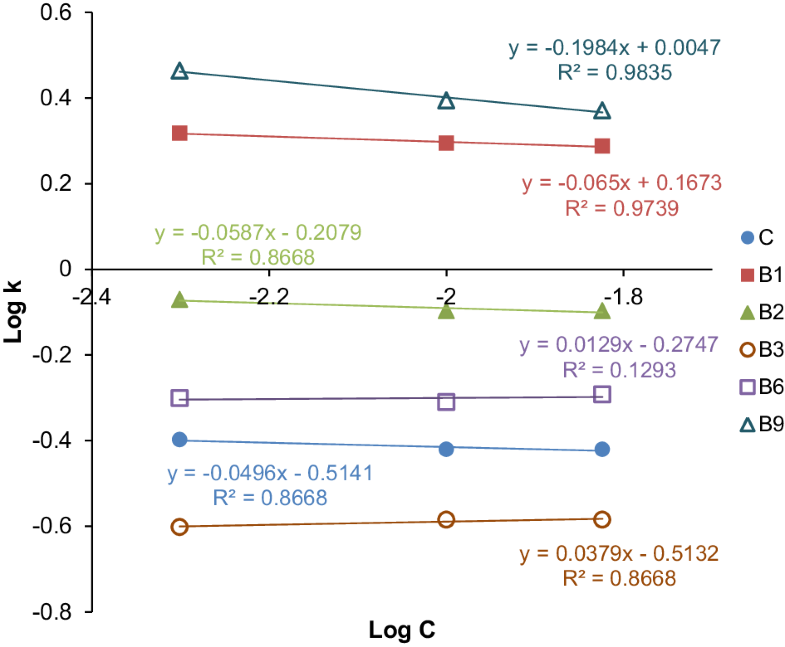 In another work, two distinct LC–MS methods based on two distinct C18 columns were developed for both fat- and water-soluble vitamins and applied to the measurement of NIST vitamin standard reference materials . Single-column analysis approaches are reported as well. For example, Li and Chen  employed multi-step gradients consisting of methanol (A), potassium phosphate (B) and water (C) to accomplish separation of 12 fat- and water-soluble vitamins on a C18 column. Klejdus et al. suggested to cope with this problem by applying in a single run a combination of isocratic and linear gradient elution to separate both classes of vitamins. Dabre et al. solved the problem of separating both classes of vitamins by mixed-mode chromatography. A general review of the state of art in analysis of vitamins by liquid chromatography is given in Ref. . The determination of water- and fat-soluble vitamins in biological fluids has been recently reviewed . 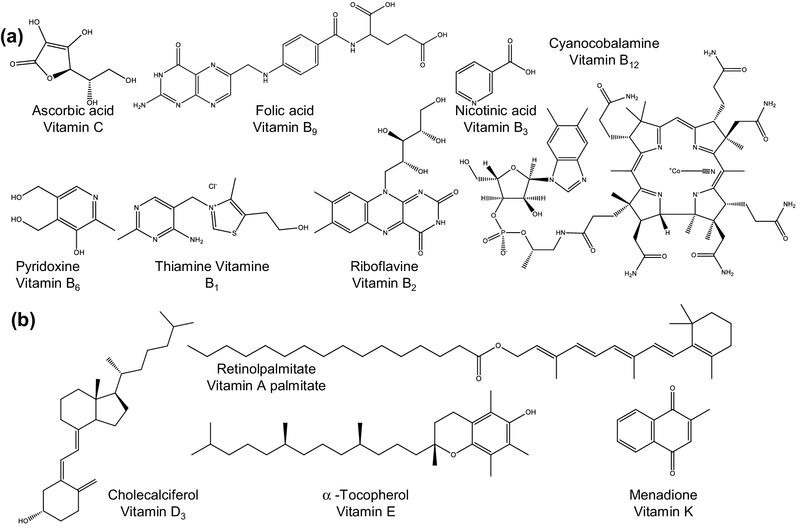 The state of art in fat-soluble vitamin analysis was reviewed by Fanali et al. .
More recent work focused on a sequential extraction and subsequent analysis of both classes of vitamins by coupling the extraction steps to LC–MS/MS and LC-DAD in order to quantify the free vitamin content . Similarly, sequential analysis of water- and fat-soluble vitamins on the same column, a core–shell C18 particle column, and same UHPLC instrument with different gradient elution conditions for the two distinct vitamin classes was suggested by Tayade et al. . 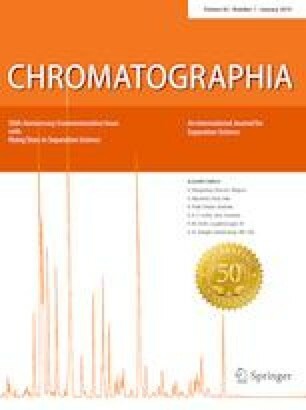 Very recently, fat-soluble and water-soluble vitamins were separated by a unified supercritical fluid chromatography–liquid chromatography approach with MS/MS detection in which the mobile phases state was changing continuously during the elution from supercritical (at 100% CO2), to subcritical (increasing percentage of methanol as additive), to finally liquid (at 100% methanol) . In another approach, electrokinetic chromatography (EKC) with polymeric micelles was utilized to separate and analyze 11 kinds of water- and fat-soluble vitamins . Besides these works, there are numerous publications describing the separation of water-soluble vitamins by hydrophilic interaction chromatography (HILIC). Fat-soluble vitamins elute close to the void in such methods. Therefore, HILIC has not been widely adopted in concepts of simultaneous analysis of water- and fat-soluble vitamins. In this work, we evaluate the simultaneous liquid chromatographic separation of water- and fat-soluble vitamins by selective comprehensive HILIC × RPLC (also known as high-resolution sampling) . A new mixed-mode chromatography stationary phase based on an N-propyl-N’-2-pyridylurea ligand linked to silica (Fig. 1) is utilized and employed under HILIC conditions for the separation of the water-soluble vitamins. The apolar fat-soluble vitamins, eluting close to the void volume of the column, are comprehensively sampled into a second dimension (2D) separation. Since HILIC is not very well compatible with the RP conditions of the 2D separation and leads to extra band broadening , active solvent modulation (ASM) [18, 19, 20] was adopted to refocus the analyte zones on the 2D-RPLC column . This work should document the potential of active solvent modulation to hyphenate HILIC and RPLC in online two-dimensional LC approaches and give some insight into the potential of mixed-mode columns  for generating complementary selectivity. Vitamins A-palmitate (hereafter short vitamin A), B1, B2, B3, B6, B9, B12, C, D, E and K (Fig. 2) were a generous gift by Fresenius Kabi (Bad Homburg, Germany). Ammonium acetate, acetic acid and formic acid were purchased from Sigma Aldrich (Munich, Germany). Acetonitrile HPLC grade was supplied by J.T. Baker (Netherlands). MilliQWater was prepared by further deionization of demineralized water using Elga PurLab Ultra Purification system (Celle, Germany). N-Propyl-N′-2-pyridylurea-modified silica stationary phase (150 × 4.6 mm, 5 µm, 100 Å) (Fig. 1) was in-house synthesized and previously characterized in detail as described elsewhere . For the second dimension (2D) separation a Kinetex C8 column (50 × 2.1 mm, 2.6 µm, 100 Å) from Phenomenex (Torrance, CA, USA) was used. The screening for general elution conditions (RPLC vs HILIC) was performed using an Agilent 1100 series LC system from Agilent Technologies (Waldbronn, Germany) equipped with an autosampler, degasser, binary pump, thermostated column compartment, and variable wavelength detector (VWD). The system was controlled by OpenLab CDS ChemStation—Edition for LC & LC/MS System (Rev.C.01.07 SR3 ). Data were analyzed using ChemStation software (Rev. B.04.03.16). The physicochemical data were calculated with Marvin Sketch (Rev. 14.12.15.0). The study of the design space was made on an Agilent 1100 series LC system equipped as above but using a quaternary instead of a binary pump as well as a diode array detector (DAD) instead of VWD. The two-dimensional LC experiments were carried out on an Agilent 1290 Infinity II 2D-LC Solution (Agilent Technologies, Waldbronn, Germany). The first dimension (1D) instrument was equipped with a quaternary pump, multisampler, column compartment and a VWD detector. The second dimension consisted of a binary pump, column compartment and a DAD detector. The first and second dimension was interfaced by a pressure release kit followed by a 2D-LC five position/ten-port valve (concurrently installed, active solvent modulation possible) connected to two 14-port multiple heart cutting valves with 6 sample loops (each 40 µL). For the experiments using active solvent modulation (ASM factor 5, split ratio 1:4), the 0.96-µL restriction capillary (85 × 0.12 mm) was installed. The system was controlled and the data were analyzed by using Open Lab CDS Rev. C.01.07SR3. Further analysis was done using LC-Image v2.7r3 LC × LC-HRMS (GC Image, LLC, Lincoln, Nebraska, USA). The concentration of the vitamins in the test mixture was 0.1 mg/mL, except vitamin B12 (1.0 mg/mL) and vitamin A, D, E and K (0.025 mg/mL), dissolved in mobile phase. Unless stated otherwise, for all 1D-LC experiments the flow rate was set to 1.0 mL/min, the temperature to 25 °C and the injection volume of the vitamin mixture was 10 µL. The vitamins were detected at 270 nm, except for vitamin A which was detected at 325 nm and vitamin E at 290 nm. Initially, the separation of fat- and water-soluble vitamins was examined under RPLC (Kinetex C8) and HILIC conditions (2-pyridylurea mixed-mode phase). To do so, the mobile phases consisted of an acetonitrile/water mixture, whereas mobile phase A contained 5% (v/v) acetonitrile and mobile phase B 95% (v/v). Both mobile phases contained 15 mM ammonium acetate, the apparent pH was adjusted to 4.5 with acetic acid in the final mixture. An RP gradient (100% A to 100% B) and a HILIC gradient (100% B to 100% A) was run. The further experiments were performed under HILIC conditions with the mixed-mode column for development of a suitable 1D method. A design space was created consisting of different acetonitrile concentrations (95, 90 and 85% (v/v)), different buffer concentrations (5, 10 and 15 mM ammonium acetate) and different apparent pH values (4.5, 5.5 and 6.5, adjusted with acetic acid in the final mixture). With the help of the design space a final gradient method was developed. The mobile phases contained 10 mM ammonium acetate and the pH was adjusted to 4.5 in the final mixture. The linear gradient was performed from 95 to 30% (v/v) acetonitrile in 10 min. In the first dimension (HILIC using N-propyl-N′-2-pyridylurea-modified mixed-mode phase), a linear gradient from 100% B (ACN–H2O; 95:5, v/v, containing 15 mM ammonium acetate (NH4Ac) in total, apparent pH 4.5 adjusted in the mixture with acetic acid) to 100% A (ACN–H2O, 30:70, v/v, containing 15 mM NH4Ac in total, apparent pH 4.5 adjusted in the mixture with acetic acid) in 10 min was performed, with a subsequent 2-min hold at 100% A. Afterwards, the column was re-equilibrated for 8 min at 100% B. The second dimension conditions (RP with Kinetex C8 column) are described in the corresponding discussion part. 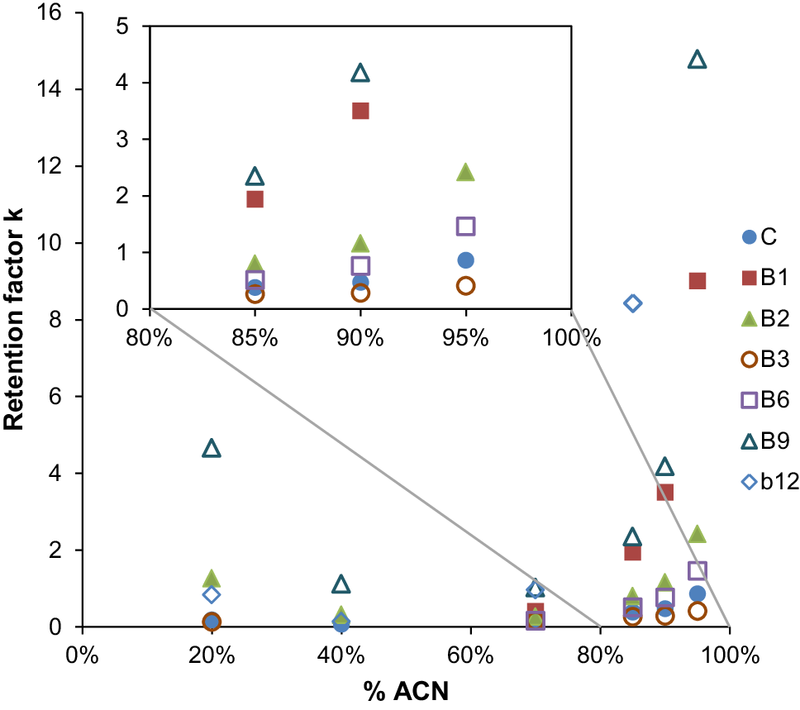 The fat-soluble vitamins were collected by high-resolution sampling and either transferred directly into the second dimension [ACN:H2O (4:1, v/v), 0.1% FA in total], transferred and focused for 0.61 min by an isocratic elution step [ACN:H2O (5:95, v/v), 0.1% FA in total] or transferred using active solvent modulation (ASM factor 5, threefold capillary flush for 0.61 min in total with (ACN:H2O (5:95, v/v)) before starting the isocratic run. In case of the directly transferred fractions, the 2D gradient time corresponds to the 2D cycle time (6.1 min), whereas in case of the focused and/or the runs using active solvent modulation the 2D gradient time is 6.71 min and focusing conditions are equilibrated until the 2D cycle ends (7.0 min). The 2D flow rate was 1.0 mL/min and the temperature was set to 60 °C. The investigated vitamin test mixture contains substances that cover a wide polarity range and are difficult to resolve in their entirety on either RPLC or HILIC stationary phases. On the other hand, they show a great structural diversity of functional groups being present for interactions with stationary phases in a chromatographic separation. In detail, the mixture contained the water-soluble acidic vitamins like ascorbic acid, folic acid, and nicotinic acid as well as basic ones like thiamine (Fig. 2). Furthermore, the amphoteric pyridoxine and the complex cyanocobalamine add to the structural complexity of the mixture leading to a wide range of polarities and charge state and thus to diverse chromatographic interactions driving the adsorption and partitioning behavior of these analytes. Table 1 summarizes some physicochemical properties of the tested vitamins which are decisive for their chromatographic retention characteristics in RPLC and HILIC. The idea in this work was to examine the retention characteristics of vitamins on a new mixed-mode stationary phase  that in dependence on mobile phase pH can be either weakly positively charged (pH < 6.5) or negatively charged (pH > 6.5) (due to residual silanols). Dependent on mobile phase pH ionic interactions with either anionic (acidic) vitamins or cationic (basic) vitamins can be superimposed upon other types of interactions such as hydrogen bonding with urea group of the chromatographic ligand, π–π interactions and/or hydrophobic with the aromatic moieties (in particular under aqueous RP conditions). Mixed-mode phases are usually more flexible in method development as they may be often operated in different elution modes (e.g., RP, HILIC or ion-exchange elution mode). For this reason, in a first screening experiment we tested which of the two conditions, RPLC or HILIC, provides a more promising strategy for further method development. The results of a positive acetonitrile-gradient elution (RPLC conditions) are shown in Fig. 3a and those of a negative acetonitrile-gradient elution (HILIC conditions) in Fig. 3b (both at pH 4.5). It becomes evident that the elution pattern in RPLC and HILIC scouting gradients is not in accordance to the log D calculated for pH 4.5 (Table 1) and is not simply following a reversal of the elution order expected from the hydrophilicity and/or lipophilicity of the compounds. Instead, a mixed-mode retention appears to be established that makes the two modes quite complementary. Overall, the HILIC elution conditions seem to give a better overall separation with less overlaps. The fat-soluble lipophilic vitamins elute unresolved at the front while the other substances are all close to baseline separated (Fig. 3b). 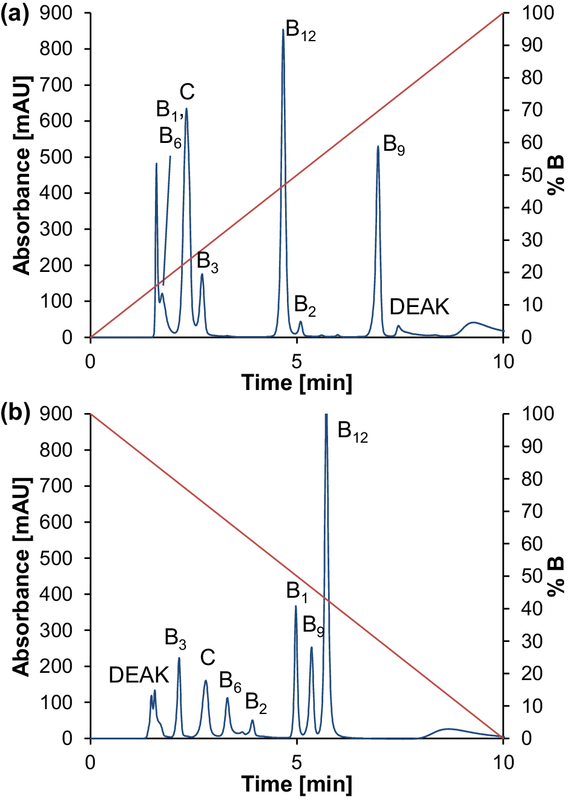 In contrast, under RPLC conditions a number of peaks are unresolved in the early eluting part of the chromatogram and the lipophilic vitamins are still not separated (Fig. 3a) although they elute late in the chromatogram. It turns out that the ligand chain is too short and lipophilicity insufficient for a good RPLC behavior of the lipophilic vitamins on this phase. The HILIC separation mode was therefore selected to be further developed as 1D separation. A systematic study of the effect of the major experimental variables was undertaken under isocratic conditions. The idea was to study the impact of mobile phase conditions on retention of water-soluble vitamins under HILIC conditions and pinpoint the design space for this type of separation. The aim was also to get insight into the retention mechanism of these molecules on the current mixed-mode stationary phase that is more difficult to understand. Accordingly, this part of the work should outline the retention behavior of polar compounds on the presently investigated mixed-mode column under HILIC elution conditions. The results of the design-of-experiment (DoE) optimization with a full factorial design on 3 levels are given in the Supplementary (see Suppl. Fig. S1–S8 and Suppl Table S1). As can be expected for a HILIC method, the acetonitrile content plays a major role on retention and this is underpinned by the coefficients plot shown in supplementary Fig. S2. Since the current mixed-mode phase has an aromatic (i.e., pyridyl) group and C3 linker connected via a urea functionality, it could be expected that the stationary phase shows some RP-type retention at low organic content. For this reason the effect of acetonitrile percentage on the retention was investigated over a wider range (pH 4.5). At acetonitrile contents higher than 60% a typical HILIC behavior is observed, i.e., retention factors steeply increase with the ACN content (Fig. 4). On the other hand, RP-type retention (i.e., increase with lower ACN content) is observed only for B9 (folic acid), B2 (riboflavin) and B12 (cyanocobalamine). It becomes evident that the lipophilicity of the pyridylurea ligand is low (note, at pH 4.5 the pyridyl ligand is partly charged further reducing the lipophilicity; pKa = 3.88 as calculated by Marvin Sketch ). 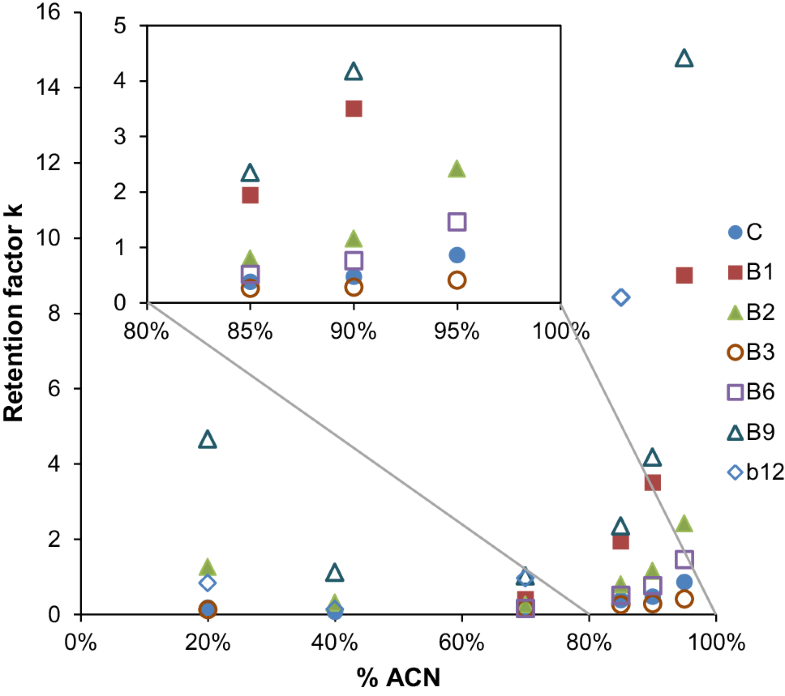 If we look closer at the elution order at high ACN percentage, we find out that it is different from what was expected from the calculated log D4.5. Acidic folic acid (B9) is stronger retained than the more hydrophilic basic thiamine (B2). At pH 4.5 the pyridyl ring is protonated and can impose a weak anion-exchange retention increment. B12, which possesses a negatively charged phosphate moiety is probably strongly retained for the same reason. Zwitterionic nicotinic acid (B3) does not show this strong retention. Overall, it becomes apparent that a mixed-mode retention resulting from common HILIC behavior superimposed by attractive and repulsive ionic interactions provides a specific opportunity for a unique retention pattern on this 2-pyridylurea-modified mixed-mode phase. The surface charge of the 2-pyridylurea-modified mixed-mode phase was recently characterized by pH-dependent ζ-potential measurements . They revealed positive surface charge below pH 6.5 and a soft weak anion-exchange capacity around pH 4–5. Due to residual silanols the surface gets negatively charged at pH above 6.5, leading to attractive ionic interactions with cationic species or moieties and repulsive electrostatic interactions with anionic species or moieties. 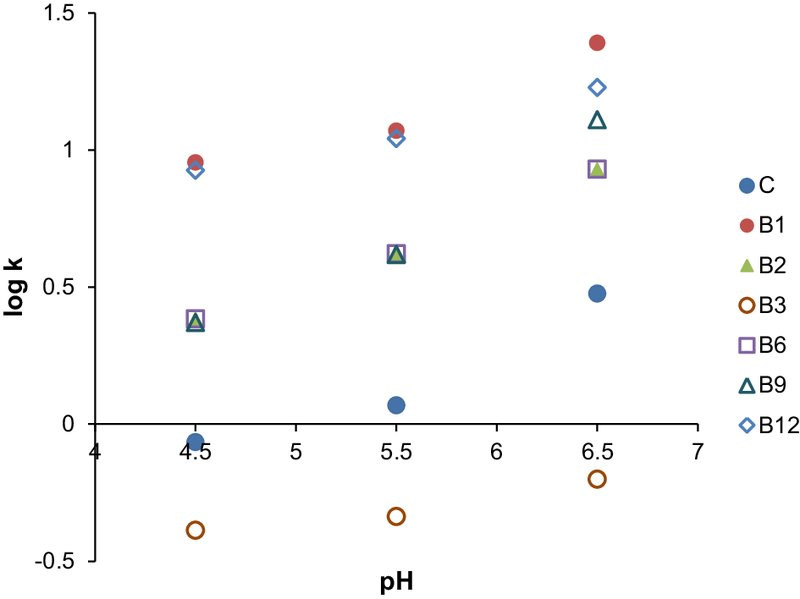 Under current ACN-rich eluents, all analytes regardless of their charge character showed increased retention factors when the mobile phase pH was elevated from 4.5 to 6.5 (Fig. 5). 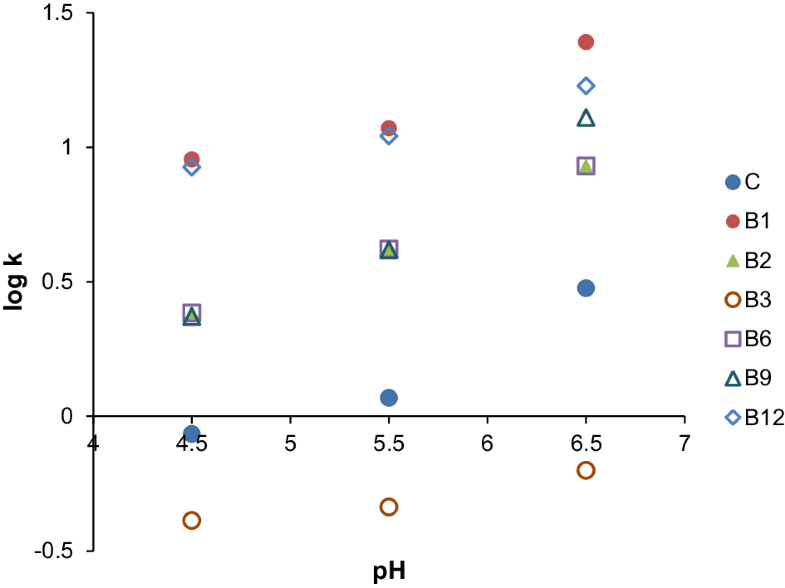 This trend follows roughly the increasing dissociation degree of residual silanols between pH 4 and 6. With increased number of dissociated silanols the surface becomes more polar causing stronger HILIC retention. The 2-pyridylurea ligand seems to have only minor modulating effect. To illustrate the extent of ionic interactions, the buffer concentration in the eluent was varied (Fig. 6). The trends are given by plots of log k vs log buffer (ammonium acetate) concentration (in accordance to the stoichiometric displacement model). Such plots should give a linear trend line with negative slope for compounds with attractive ionic interactions (here at pH 4.5 anion exchange for acidic compounds) while the slope is expected to be positive for compounds for which repulsive ionic interactions are dominating (at pH 4.5 net positively charged analytes). Strong silanol interactions may mask the effect of the chromatographic ligand. It can be seen that folic acid (B9) is the only compound with a significant anion-exchange contribution (negative slope of ca. − 0.2; corresponds to the effective charge ratio of analyte and counterion). B1, B2 and C also reveal a slightly negatively charged slope (ca. − 0.1). While this is understandable for ascorbic acid for which anion-exchange process can be expected, for B1 (thiamine) it is more likely due to cation-exchange at the silanols. For the other compounds (B3 and B6), slightly positive slopes are observed and can be explained by absence of strong ionic interactions or very weak repulsive electrostatic interactions. Overall, this stationary phase imposes only soft ionic interactions on the given analytes and is mainly driven by HILIC retention mechanism under the selected conditions. From above screening experiments and DoE study, useful conditions for the design of a selective comprehensive 2D-LC separation, which was found to be most promising solution to solve this problem of the simultaneous analysis of water- and fat-soluble vitamins, could be identified. Some further optimizations were then carried out for 1D and 2D gradients. For the 1D-HILIC gradient separation, gradient time, gradient steepness, and mixed buffer–acetonitrile gradients were tested as variables for optimization of the resolution of the water-soluble vitamins. The results are given in supplementary material (supplementary Fig. S9 to Fig. S11). Full baseline separation could be achieved when the 1D gradient time was at least 10 min or larger (Suppl. Fig. S9) and gradient steepness was at least 35%B in 10 min (with initial %B always 5%, tG = 10 min) (Suppl. Fig. S10). The effect of a superimposed buffer gradient upon the acetonitrile gradient was minor (Suppl. Fig. S11). For the water-soluble vitamins, an optimized HILIC separation with a full baseline separation could be achieved under the conditions shown in Fig. 7a. The early eluted fat-soluble vitamins were then separated in the 2D by RPLC using a high-resolution sampling approach, also called selective comprehensive HILIC × RPLC. 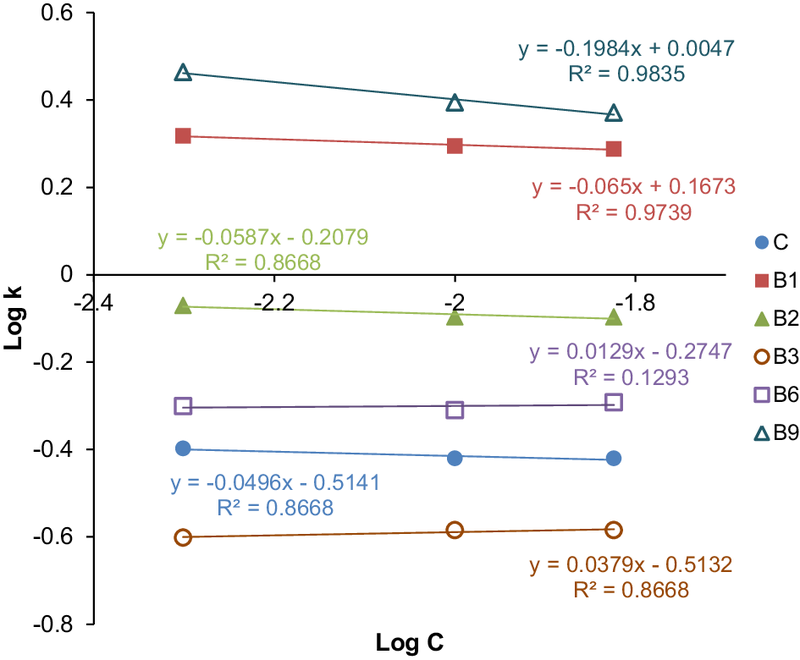 Since the fat-soluble vitamins differ sufficiently in their lipophilicity (log P values are listed in Table 1), the level of hydrophobic interactions occurring on a C8 phase is well suited for the baseline separation under optimized conditions. The goal of the optimization was therefore to accelerate the separations and keep the 2D run time as short as possible. One has to consider that the 2D runs of the various cuts are performed serially and therefore cumulatively contribute to the entire analysis time (see Electronic Supplementary Material Fig. S14). The speed at which the 2D separation can be performed is therefore decisive for the overall analysis time. A core–shell particle C8 column was therefore used because they allow faster separations as compared to sub-2 µm C8 columns of the same dimension. As a further optimization parameter, temperature was investigated. Suppl. Fig. S12 depicts chromatograms of the mixture of the fat-soluble vitamins at two distinct temperatures, 50 and 60 °C. It can be seen that this slight increase by 10 °C has a significant influence on the speed of separation with a reduction of run time for the 2D separation from ca. 7 to ca. 5 min. 60 °C was hence maintained as column temperature. Various gradients (from 70, 80 or 90% B to always 97%B in 4 min with a 1-min hold at 97%B before re-equilibration; B composed of acetonitrile with 0.1% formic acid) were tested (Suppl. Fig. S13). It turned out that for fast elution the %B should be between 80 and 90%. In order to save the re-equilibration time, an isocratic 2D separation column temperature of 60 °C and a flow rate of 1 mL/min were finally adopted as optimal 2D separation (Fig. 7b). It allows to finish the 2D separation in about 3 min, as to keep the entire analysis time acceptable (see Electronic Supplementary Material Fig. S14) (vide infra). Neither the polar mixed-mode stationary phase with 2-pyridylpropylurea ligand nor RPLC with C8 core–shell column were capable to resolve the entire mixture of fat- and water-soluble vitamins. Hence, a two-dimensional LC approach was established. 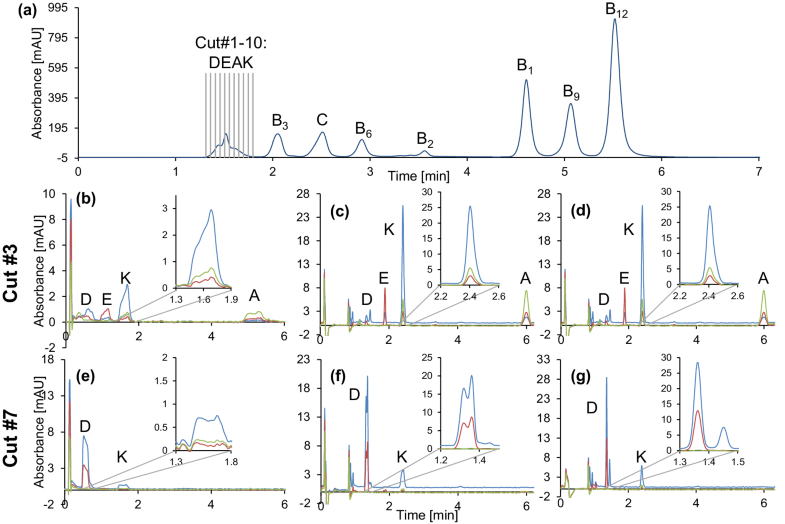 Only the early part of the 1D HILIC chromatogram on the 2-pyridylpropylurea mixed-mode column which contained the coeluted fat-soluble vitamins was switched into a second dimension by a comprehensive sampling of 1D eluates into 2D RPLC. This mode of 2D-LC is called selective comprehensive HILIC × RPLC or simply high-resolution sampling. It should be noted that with a large loop a single fraction of the lipophilic vitamins could be switched onto the RP column. However, due to severe solvent incompatibility trap columns for refocusing should be used . In our proof-of-principle high-resolution sampling method, a standard 2D-UHPLC system can be used on routine basis without changing loops or the setup. An easy handling of the quantitation is also offered by the Open Lab CDS Rev. C.01.07SR3 software which allows the identification of the peaks in the cuts and automatically sums up the peak area of a single compound. Thus, the first dimension (mixed-mode column) was coupled to a second dimension (Kinetex C8 column) by a two position 4-port dual valve which was connected to two loop decks each one equipped with six 40-µL parking loops (Fig. 8a). Of those loops, 5 can be used to sample fractions, while the 6th loop must be free for mobile phase flow. Thus, 10 cuts across the unresolved DEAK peak (Fig. 7a), each of 40 µL eluate of 1D separation, starting with sampling from 1.35 min in the 1D HILIC run were made and analyzed by 2D RPLC. Like already expected the directly transferred 1D eluent caused broadened, distorted peaks in the second dimension when 100% loop fill was adopted (Fig. 9a). This distortion effect is usually especially prominent for high injection volumes (i.e., here 40 µL) and is due to mobile phase incompatibilities of 1D (HILIC) and 2D (RPLC) eluents. 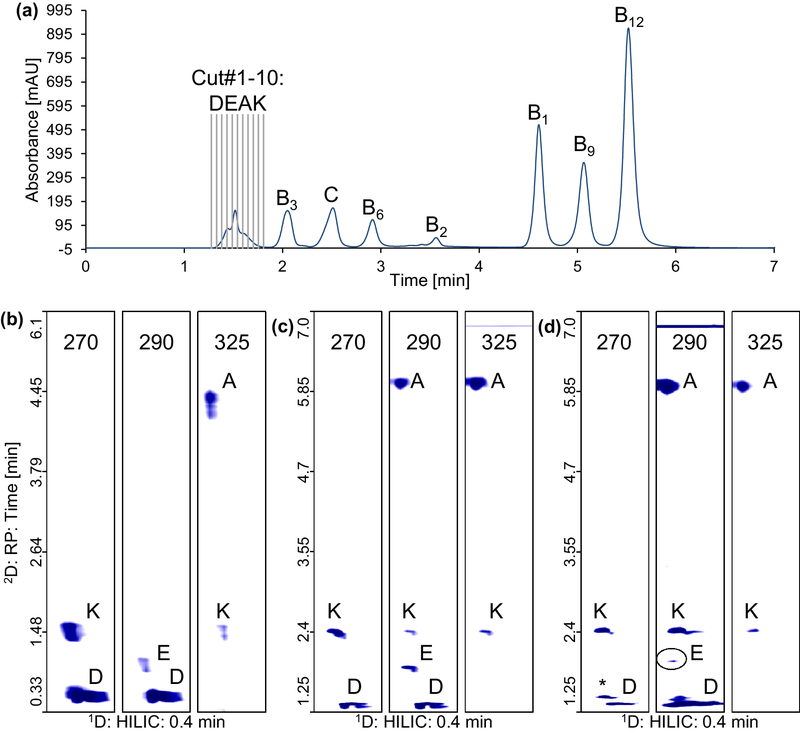 The sampled 1D mobile phase represents the sample matrix of the 2D separation and the high acetonitrile content of the HILIC eluates during sampling of the ADEK peak exhibits too strong elution strength in 2D RPLC, in particular for the weakly retained analytes (D, E, and K). In contrast, the highly lipophilic and strongly retained retinol palmitate (vitamin A) seems to get refocused on the C8 phase. The online coupling of HILIC and RPLC is a challenging exercise since mobile phase mismatch is a well-known problem [23, 24]. A number of solutions to the incompatibility problem have been suggested, e.g., trap columns for modulation , dilution of 2D eluent with weak mobile phase using an additional pump, fixed-loop modulation  and others. Herein, we first tested partial loop fill which already showed limited advantageous effects on the 2D peak shape . We studied reduced filling levels of the parking loops from 100% to 70 and 60%. Indeed, the peak shape and peak width improved using a loop fill level of 70 and 60% exemplarily shown in the chromatograms of cut #5 in Fig. 9 (loop fill 70%, Fig. 9b and loop fill 60% in Fig. 9c). A disadvantage of this strategy was that the collection time of the peak in 1D decreased leading to incomplete sampling of the peak at the rear end (100% loop fill level covers a peak width of 0.4 min, 60 and 70% only 0.24 and 0.28 min, respectively). Since the 1D peak (peak width = 0.4 min) requires 100% loop fill in the first dimension (if the loop volumes are not increased) in order to avoid loss of analyte and sample disproportioning, an alternative strategy had to be used for comprehensive characterization of the fat-soluble vitamins. Alternatively, peak focussing by an initial isocratic step at low organic modifier content of 5% B before an isocratic elution at 80% B was applied to reduce peak distortions due to mismatch of the 1D sample solvent and the mobile phase. The resultant chromatograms are shown in Fig. 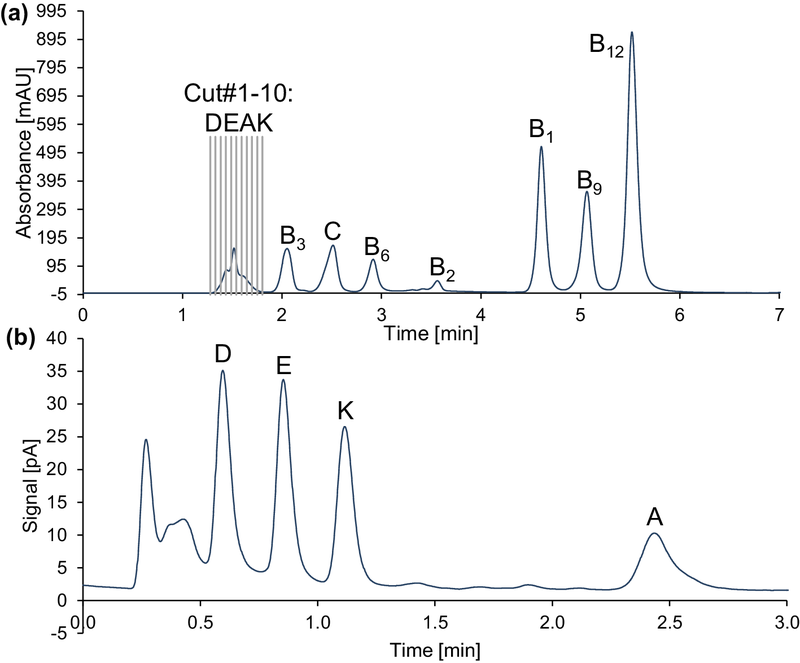 10c, f for cuts #3 and #7 in comparison to the chromatograms obtained with direct transfer which are depicted in Fig. 10b, e. It can be seen that the refocusing at low elution strength works well for the stronger retained analytes such as vitamin A, K and also vitamin E (Fig. 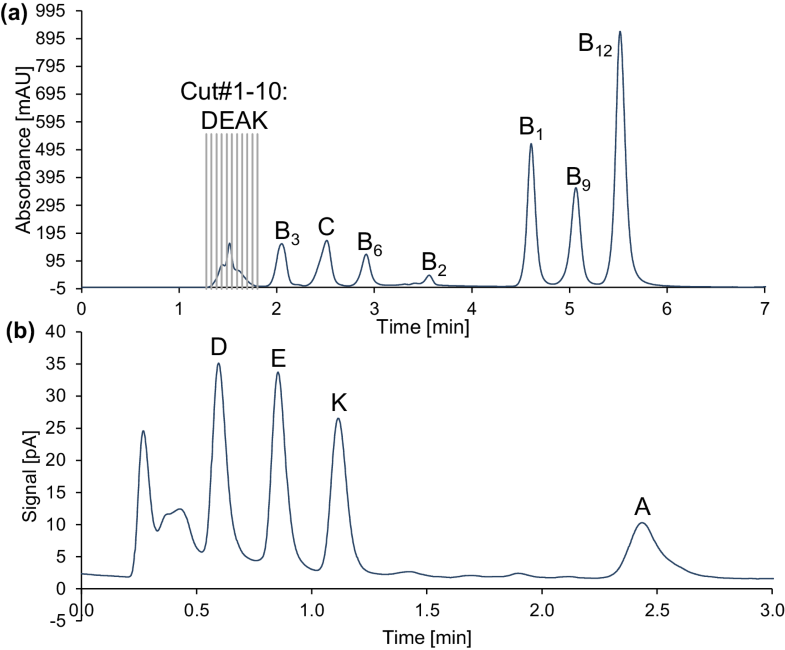 10c) but fails for early eluted vitamin D for which a peak splitting/double peak was observed (Fig. 10f). To overcome this problem, the active solvent modulation (ASM) valve (Fig. 8b) was activated and the corresponding chromatograms are given in Fig. 10d, g. The ASM valve allows four positions (Fig. 11) . In Fig. 11, the valve switching beginning with the sampling in Deck A and ending with the analysis of Deck B is depicted. In Fig. 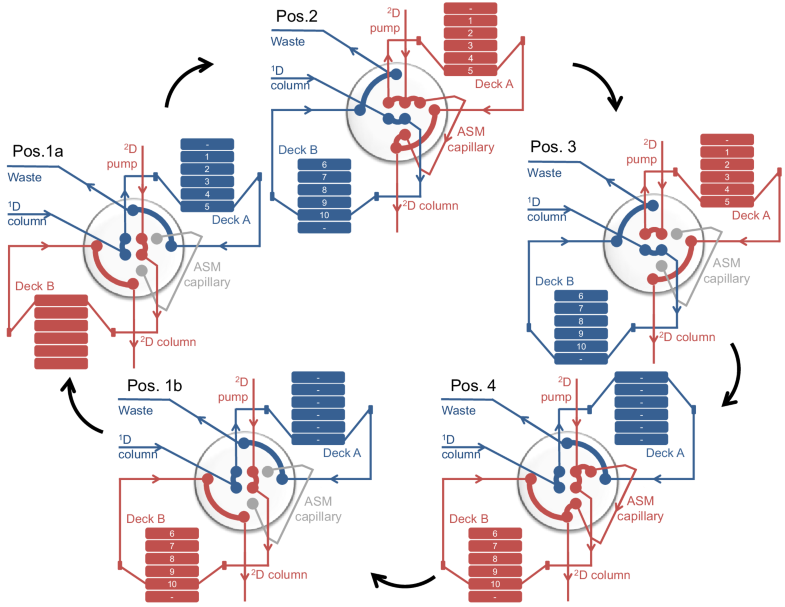 11 Pos.1a the 1D eluent is transferred and sampled into the multiple heart cutting (MHC) loops of the Deck A ending with cut #5 in the sixth loop. Then the valve switches like it is shown in position 2. The new position enables on the one hand the sampling of further cuts in Deck B. On the other hand, the analysis of previously sampled cuts starts. The flow of the mobile phase of the second dimension is split in the valve. According to the installed ASM capillary (bypass capillary), the flow is divided into one part which transfers the sample from loop deck A and four parts which go through the ASM capillary, for example. Both flow streams are reunited in the valve and directed to the 2D column. In this way, the cut is diluted before it is transferred to the 2D column and the solvent mismatch is reduced. The number of ASM capillary flushes can be adjusted. Once the sampled volume is completely transferred, the ASM phase is finished and the valve switches to position 3 where the whole flow is led through the MHC loop. After finishing the analysis of this cut the MHC valve switches to the other cuts (not shown) and the analysis starts in the same way with the ASM phase like already described. 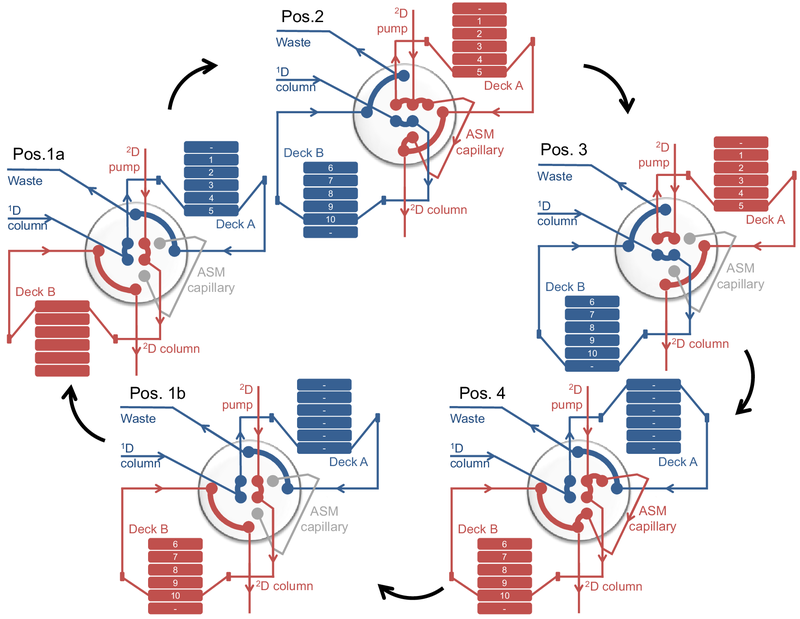 As soon as all the cuts stored in Deck A are analyzed, the valve switches to position 4 where the ASM phase of the last 1D effluent sampled in the MHC loops starts. Afterwards, the valve returns to start position and the analysis without enabled ASM of Deck B is possible (position 1b). In general, the bypass dilutes the stored fraction before being transferred onto the 2D column which gives a refocusing effect of the sample zone. The ASM factor is dependent on the installed ASM capillary. Herein, we used the smallest available ASM loop leading to the (largest) dilution factor 5. This is necessary because of the high elution strength of the composition of the 1D eluent under RP conditions used in 2D, as well as the lower tolerance of high injection volumes due to the column dimension in the second dimension (50 × 2.1 mm) . In consequence, the mismatch of the start conditions in the second dimension and the solvent of the sample from 1D decreases. In cut #3 vitamin A showed no further improvement in efficiency (see Electronic Supplementary Material Table S2) by using the ASM valve (plate number N = 11,500) as compared to gradient refocusing without ASM (N = 10,100) because it is strongly retained (cf. Fig. 10d vs c). The same was observed for vitamin E. Vitamin K exhibits slightly higher efficiency with ASM in cut #3 (Electronic Supplementary Material Table S2). Finally, Vitamin D peak shape and efficiency was greatly improved and turned into a symmetric Gaussian peak with ASM (Electronic Supplementary Material Table S2). Additionally, the vitamin A peak was completely separated into a main peak and a peak of an impurity/degradation product in cut #7 with ASM (see different UV spectra shown in Electronic Supplementary Material Fig. S15) while only a shoulder was observed by gradient refocusing (cf Fig. 10g vs Fig. 10f). Overall, the positive effect of ASM is striking and can lead to significantly improved separations when HILIC is coupled to RPLC in 2D-LC high-resolution sampling. 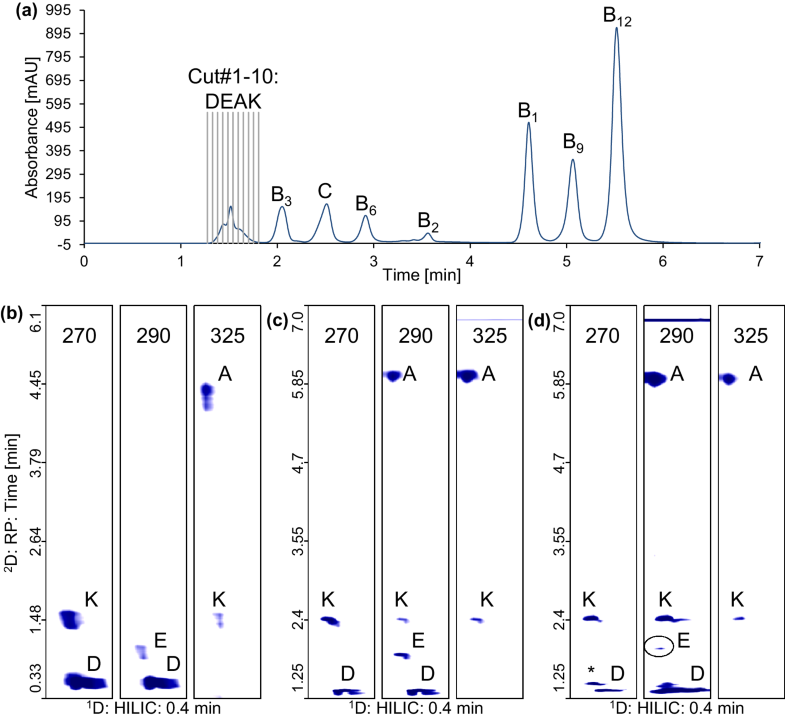 The chromatographic traces of the cuts #1–10 from the high-resolution sampling can be reconstituted into a comprehensive chromatogram using LCxLC-image software (Fig. 12). Comparing the contour plots in Fig. 12b–d, it becomes clearly evident that the zones in Fig. 12c (gradient refocusing) and Fig. 12d (ASM) are sharp while they are extremely broad in Fig. 12b (direct transfer of HILIC fractions). In the contour plots of Fig. 12d, wavelength 270 nm, two peaks emerge with ASM which are not separated in the corresponding UV trace of Fig. 12c (gradient refocusing), underlining the advantage of ASM. Vitamin D is the first eluted of the two zones. A selective comprehensive 2D-LC with a 2-pyridylurea-modified silica stationary phase operated in the HILIC mode in the first dimension and a RP C8 core–shell column in the second dimension allowed the simultaneous separation of fat- and water-soluble vitamins in a single analysis. The HILIC separation in 1D enabled a baseline resolution of all water-soluble vitamins and the 2D separation by RP C8 of all fat-soluble vitamins. The two separation modes were coupled to get a full separation of all analytes. Since only the fat-soluble vitamins remained unresolved in the 1D, only the region of the chromatogram close to the void where the fat-soluble vitamins eluted was comprehensively sampled into the 2D (high-resolution sampling, selective comprehensive 2DLC). Upon direct transfer of the collected 1D-HILIC fractions into the 2D-RPLC column, peaks were distorted and broad due to mobile phase incompatibility. Gradient refocusing starting the 2D gradient with very low modifier content has led to refocusing of the zones of late eluting peaks while early ones were still broad with some loss in resolution as exemplified for vitamin D. Using active solvent modulation, this problem could be solved and all peaks showed good peak shape and optimal resolution. 2D-LC hyphenating HILIC and RPLC is therefore a good option for the simultaneous separation of fat- and water-soluble vitamins. The method should be also applicable to quantitative analysis of vitamins in multivitamin supplements. For this purpose, like for the analysis of vitamins in food extracts or other more complex mixtures, elution conditions may need some adjustments. In this case, matrix components may coelute with the lipophilic components in the 1D HILIC separation and will be switched into the 2D where the lipophilic analytes can be resolved from matrix components. This is the topic of ongoing studies. ML is grateful to Agilent Technologies for financial support through an Agilent Research Award. Stephan Buckenmaier (Agilent Technologies, Waldbronn, Germany) is gratefully acknowledged for technical support. This study was funded by an Agilent Technologies Research Award (Grant Number Agilent Research Gift #4068). Author ML has received a research grant from Agilent Technologies. Other authors declare no conflict of interest.